➤ Following highs in the low-mid 80s today, a weak cold front tonight will bring temperatures back down to seasonal levels tomorrow and Wednesday. ➤ A bit warmer on Thursday, ahead of the next cold front, with temperatures in the lower 80s. 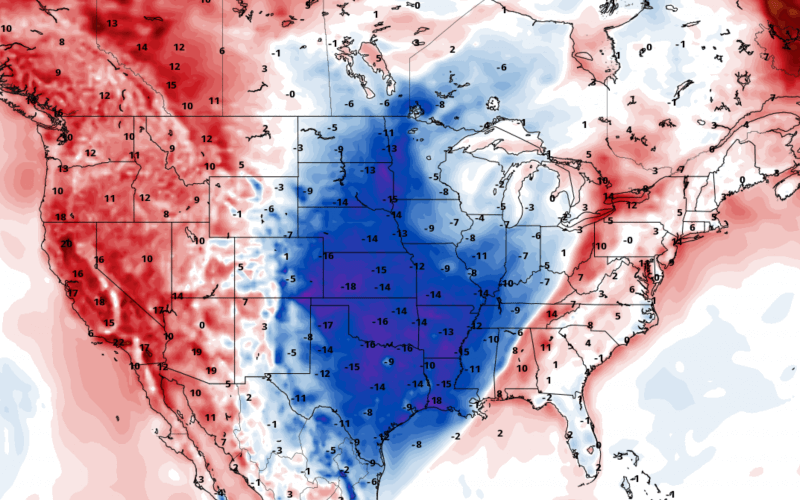 ➤ I expect the cold front to arrive early Friday morning, with falling temperatures. The official high on Friday will likely occur before sunrise (mid 60s), with temperatures falling into the 50s during the morning. As it looks right now, temperatures should stay in the 50s most of the day Friday and Saturday. Lows may fall into the 30s for much of the area, especially Saturday night. As always, temperatures will be slightly warmer inside the DFW urban heat island. ➡ Wednesday 10/25/17 Update: Widespread frost expected Friday night, with much of North Texas below freezing. Friday: Cold front early. Mostly cloudy. High in the mid 60s before sunrise, falling into the 50s for the rest of the day. Lows Friday night in the upper 30s to lower 40s. Saturday: Clear. High in upper 50s to lower 60s. Lows Saturday night in the mid 30s to around 40º. Sunday: Clear. High in the mid 60s.